On March 26 – 28, 2019, Harris Mufson, Danielle Moss, and Samantha Regenbogen attended the second annual HR Transform conference in Las Vegas, Nevada. 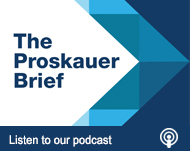 Proskauer was the exclusive legal sponsor of the conference. The HR Transform conference brought together business leaders and HR executives to discuss cutting edge issues regarding human resources and employee workplace issues. On March 27, Harris, Danielle and Samantha hosted “office hours” during which they answered attendees’ employment law questions and unveiled Proskauer’s “Employment Law Toolkit”. The Toolkit is designed to provide client with a cost-effective solution to implementing comprehensive and cohesive employment documents. It includes a new hire checklist, template offer letter, interview guidelines, restrictive covenant agreement, model handbook, and template separation agreements. Please reach out to Harris, Danielle or Samantha for pricing and further information. The next day, Harris moderated a panel entitled “#MeToo Implications on the Workplace”. Harris was joined by panelists Marjorie Ajero (Chief People Officer at Bettercloud), Heidi Grothaus (VP, People Operations at Slate) and Dawn Sharifan (Head of People Operations at Slack). Harris and the panelists offered insights into the key legal developments and unique issues that employers face in the wake of the #MeToo movement, including approaches to addressing romantic relationships in the workplace; advice for navigating (and avoiding) #MeToo backlash; considerations regarding “zero tolerance” policies; and best practices for fostering a harassment-free workplace.